Benchmarking is the largest activity within the MESoR project. The aim of the benchmarking exercise is to establish a coherent set of benchmarking rules and reference data sets to enable a transparent and comparable evaluation of the different solar radiation data sources. The rules are developed in conjunction with the IEA Task 36 on “Solar Resource Management” of the Solar Heating and Cooling Implementing Agreement and shall serve as a standard for benchmarking to make results comparable. 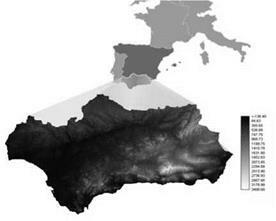 The region of the study is the area of Andalusia, in the southern part of Iberian Peninsula (Figure 1), covering around 87.000 km2. The region is located in the transition zone from middle latitudes to subtropical climates (latitudes 35° 30′ to 38° 30′ N and longitudes 7° 30′ to 1° 30 W), with the Atlantic Ocean and the Mediterranean region in the southern bound. The experimental dataset used in the study includes four year (2003-2006) of daily global radiation in the horizontal surface values, measured at 166 meteorological stations along the study region. The calculation of the direct normal irradiance is performed in different steps. 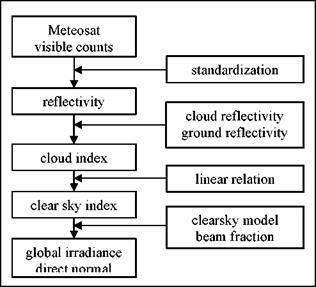 In a first step cloud information is derived from the satellite measurements using an enhanced version of the Heliosat method . As a measure of cloudiness a dimensionless clear sky index k* is derived. Using a clear sky model the global irradiance is immediately related to the clear sky index, while our new beam fraction model allows for calculating the DNI. Fig. 1 represents the necessary process steps, which are described in this section. Fig. 1: Significant process steps of the Heliosat method.